Your first back carry can be a bit daunting. 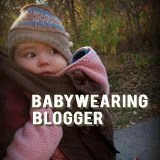 In this video below, I am using my Catbird Baby Pikkolo carrier (though the method is similar for any buckle/SSC carrier, except with others you would buckle the structured waist belt around you with the structured waist sitting on top of your hip area and the body of the carrier flopping down from the top of the structured waist belt). First, I show a classic back carry with the carrier hanging down from your back, baby is scooted around (using the “hip scoot” method) and the carrier is brought up from between her legs and over her back. After that carry, I demonstrate a carry in which you bring baby AND the carrier around with you. This method is better for the beginner, because you can secure baby as you bring the carrier around and there is less to worry about…though it does tend to move your clothes around with you as you move baby in the carrier from your hip to your back.